Aptec to market NET portfolio of products. Relationship Provides Major Step in NET’s Middle East Growth Strategy. Fremont, CA, October 10, 2010 – Network Equipment Technologies, Inc. (“NET”, NASDAQ: NWK), today announced the appointment of Aptec Holding as distributor for the Middle East markets of UAE, Saudi Arabia, Egypt, Lebanon, Turkey, Kuwait, Oman, Qatar, Bahrain, Morocco, Algeria, Tunisia and Pakistan. Under the agreement, Aptec Holdings will distribute the entire suite of NET products through its strong reseller base to address market demand for enterprise solutions for unified communications (UC) and Enterprise Border Controller applications. The agreement with Aptec Holdings, a leading distributor with particular expertise in the convergence of voice, data and video applications and technologies, is a major step in NET’s Middle East growth strategy to expand sales channels for UC environments. Aptec serves all key segments of the regional enterprise market: large enterprises, the mid-market including call centers, and the SMB (small and medium business) office and mobility markets. “After the early success we have seen within the Middle East/North Africa region, we believe that partnering with a distributor like Aptec can further grow NET’s support and presence to local partners and customers. 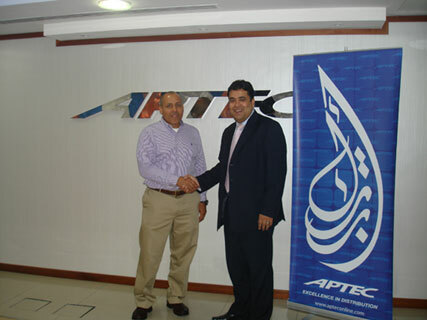 With Aptec’s large reseller community, physical presence and years of experience across the region, including affirmative compliance with export requirements, Aptec can provide resellers with improved support of NET’s full product line,” said Nauman Afsar, Regional Manager (MENA), NET Dubai. “The enterprise market in the Middle East is quick to embrace newer technologies. With NET’s offerings of VoIP and UC solutions, our reseller partners can deliver an integrated IT platform for voice, data and multimedia to enhance their customers’ productivity and performance goals. With this partnership, we believe we can add true value to our resellers with a unique product offering supplemented by our distribution support activities,” said Bahaa Salah, Managing Director, Aptec Distribution FZ (LLC).